Some may say that kindergarten-age kids are too young to understand the basics of addition. Not us! Plenty of preschoolers are perfectly capable of comprehending that if you combine two numbers you'll get a different number (unless you're dealing with the number zero, of course). While your preschooler is working hard on his worksheets, it might be beneficial to include a physical demonstration of the maths problems, especially if your kid is having a little trouble understanding what's on the page. Our printables are a great way for kids to get a jump on year one maths. It'll all add up for your preschooler with these addition worksheets. 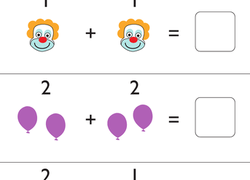 A counting worksheet for preschoolers, featuring pictures of balloons. A counting worksheet for preschoolers, featuring sofas, chairs, and cushions. A counting and addition worksheet for preschoolers, featuring a bird theme. If your preschooler loves all things fairy, she'll enjoy this worksheet that will help get her counting and learning to add!